I don't think it's a problem with the software or anything, as it only really does it when I have lots of raytraced reflections, refractions etc going on, but I'd really like to stop it from happening. Rendering can take days, which is fair enough for a complex scene, but when I also can't use my PC for anything else (I'm lucky to be able to get on here and post, let alone anything else! ), it starts to get really old, really quickly. Is there any way I can force Poser (or the FFRender program) to only use a limited amount of CPU and RAM without making it unstable? If a render is to take days, it is to take days, but I want to be able to do something with my PC during that time. Like I said, it doesn't tend to happen with less complex scenes, so I don't think it's a bug, I just want the option of keeping a customisable percentage of my resources free for other programs to use. @Glen85 one thing you might consider is optimizing your render settings. what are your setting at when your render takes days? 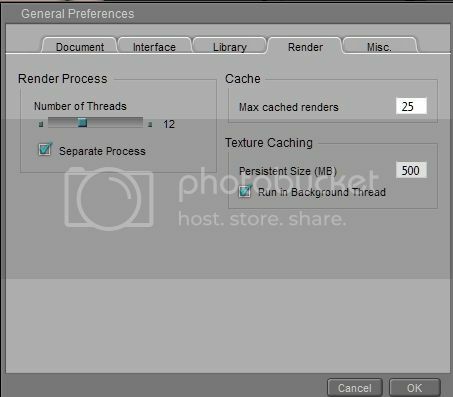 Secondly, in the same screen =>You can render inside Poser or as Separate process. Third => Pro versions can render in Queue. Four => You can set the Priority of Poser.exe and FFRender.exe (or any other) in Windows through the Taskmanager. Thread reduction is one way to free up CPU but not the best. The best is vilter's last suggestion, which is to just lower the priority of Poser so it gets all the CPU except when ANY other program wants some, then it doesn't. This way, if you're just reading a web page doing nothing, Poser uses 100%, but the millisecond you click a link to go look at another web page, all the CPU goes to the browser, until the browser is once again idle. In other words, by lowering the priority of Poser, you set it to "borrow" CPU instead of "own". Any program that is doing work on your behalf will take it back from Poser until it doesn't need it. C:\Windows\System32\cmd.exe /c start "Poser" /belownormal "C:\Program Files\Smith Micro\Poser 11\Poser.exe"
Rendering in a separate process can free up the Poser UI, but the renderer is still "owning" and not sharing nicely. Change the priority and it only borrows, whether you're doing foreground or background rendering. On a personal side note : If I see a render going over an hr? It's time to investigate. if a render takes days? It is time to investigate the materials setups. Pretty sure some nodes are "fighting". This is one of the major improvements in Poser11. One of the major tasks when rendering older stuff in Poser11 is to finetune the material setups. This alone can bring render times down by many hundred of %. Before Poser11, you could connect anything to anything in the Material room, and Poser would fight it's way through them all. Now Poser 11 can show you what is wrong in each material zone, and you can correct the material setup before starting the render. Changing these settings allows other apps to "borrow" CPU time. Most time can be "won" by investigating each material zones node setups in the Material room. And "use" the available IDL to reduce the number of lights required. How many "lights" are there in "real life"? For details on setting the process priority, you can always look a this site. Plenty of my scenes take that long to render. If your scene has lots of geometry, and uses mesh lighting, plus you want glass (with thickness) et cetera, then it will take some time to clean up the graininess. And I always check the message log for invalid material node connections and correct any found. Try doing a complex night scene in Superfly lit by mesh lights. Correct, but the OP asked for PP20104 and FireFly. @vilters The same complex night scene, rendered in Firefly with raytracing , indirect light, subsurface scattering, and displacement engaged, would also take a long time. Thanks for the replies, everyone! I'll post my render settings shortly, I'm just waiting for the settings window to come up (it has been over four minutes since I clicked it... yes, it takes that long!) then I'll screenie it and pop it over. I've overhauled my render settings multiple times after posting here and on Rendo and taking advice, so I'm confident that it is about as good as I'm going to get, and I rarely change them, only to add DOF etc. Render in separate process is something I've done for years. Render in queue has been buggy since before PP2014 for me; just a simple render of an empty scene takes, no joke here, WEEKS, but never completes because, as soon as my PC is shut off for any reason, it wipes it. I've given up on queue these days. Priority is what I think is needed. Yes, decreasing rendering time would be an obvious advantage, but even if it took an hour, it would still be an hour with a cucumber instead of a PC. My scenes usually render ok, within the hour and without the drama, but there are scenes which just drain the life out of my PC. This one is probably the most demanding ever; it is an outdoor scene featuring a complex pool resort, featuring a load of rails using EZMetals chrome shaders, a refracting water shader for the pools, non-refracting glass for the windows, with RT reflections and many, many intricate meshes for furnishings etc. There are a few mesh lights and IDL is always used in my work. I have two 'lights' in my scene; an infinite 'Sun' and an infinite 'filler' light which doesn't cast shadows. The latter is set to a very low percentage, but the former is extremely bright, as it should be. Being an outdoor scene, I've really struggled to get the lighting right with this, but I think I've just about managed it now, going by the results so far. I won't know for sure until I can examine the render properly though. While we wait for it to take its precious time and load the render settings, here's a look at an old render of the scene, showing the lighting I used to use and the pool water, which I'm still using on this latest project. I read somewhere that, with Poser, changing the priority can make it crash. Is this the case here, or would it remain stable? Hmmm... that hints at another cause of your problems. I would classify your scene as simple, so it's not that. Here's an example render of the scene I'm working with. Obviously adding characters adds more to the render time. Just a note to the forum people: Please get rid of this stupid size limit for image uploads! This is a graphics forum; what's the point of that? I need to be uploading the images I'm producing, as they are when they are exported from your software. Not only that, but as a dyscalculic soul, it is an enormous task to resize an image in pixels to make it a file size in MB and compare that size to your size in KB! Hard work, unnecessary, please stop! @Glen85 You could convert the pics to jpeg for upload to here. There's not really a need to upload a 4mb .png image like your last pic. For example, here is your last pic, but it's now only a 645kb jpg as opposed to a 4,040.77kb png. I used Irfanview to 'save for web' to convert it and personally can't see any image difference. I didn't even think of that, as jpg is my go-to format these days and has been for years! In which case, my apologies. I'll try to remember in future. I run the render in a separate process, have done for years now. I don't know how much CPU and RAM it uses precisely, but it's more or less 100%, as I can close literally everything up and just have it sitting there, rendering and continually freezing up and going nuts. The Poser .exe is on my C drive, but the runtimes and temp folders are on an external and a secondary internal drive respectively.